This brochure points out that that good oral hygiene and a healthy diet is important to both mother and baby. 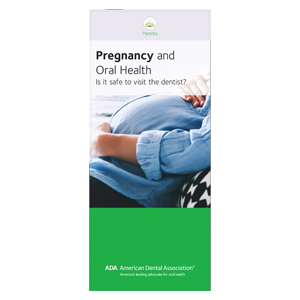 It emphasizes the ADA’s position that oral health care is generally safe at any point during pregnancy– even routine radiographs and being given local anesthesia. Explains how increased hormone levels can affect the gums and how to fight tooth decay with a healthy diet and daily home care. Reminds patients to discuss any medications with the dentist. Pack of 50, 8 panels.